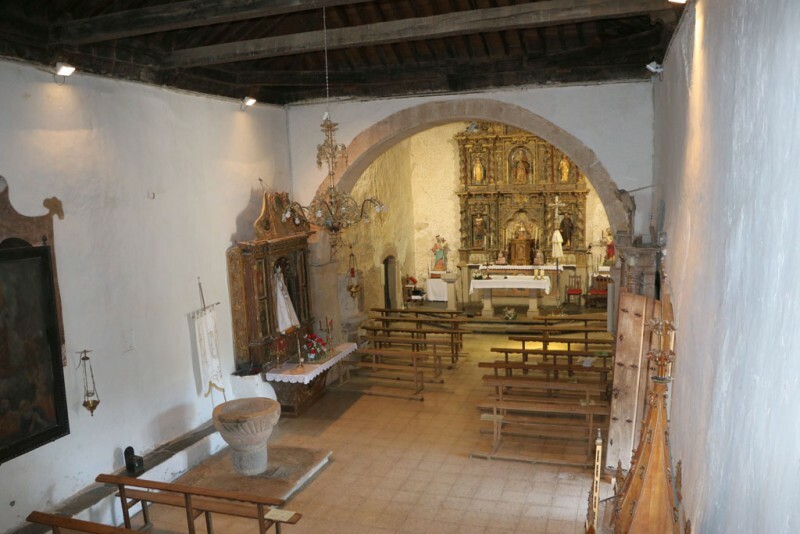 We have no documental information regarding the origin of the Santa Eulalia church, and that which we have are vague references already from the 18th century. However, its typological aspects and the mural paintings in its presbytery, dated from the 16th century, show an origin at least to centuries prior to these written references. In this sense, over the church, in the parochial archives, there is documentation from 1620, which indicates to us the at least existence of the church in said moment. It is a small temple, made of ashlar and masonry, with cubical forms in which different added parts and reforms can be seen. It has a single nave, covered by a gable roof and with a quadrangular chancel, to which other bodies have been added; an entrance portico to the south with three arches over simple columns, between this and the belfry, a warehouse converted into a bathroom, with a sacristy and a chair terraces to the nave on the northwest. 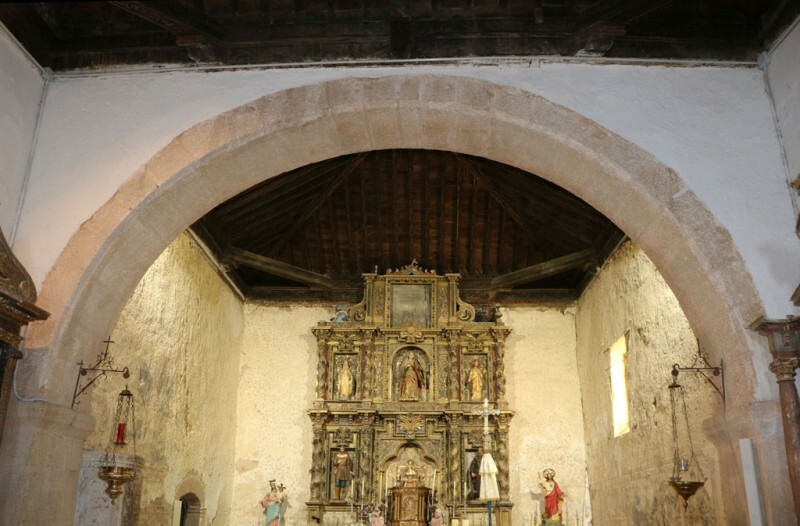 Inside, the great triumphal architrave stone arch between the nave and the apse must be mentioned, as well as the painted and varnished wooden ceiling, with a vegetable pattern in the straps, the pair, the wooden supports and the seatings, in the central nave, apse and sacristy. The church also holds several late baroque altarpieces, amongst them the largest one that as a carving of the patron, a stone baptismal font, perhaps medieval, a decorated pulpit and a simple wood chancel, from which one can access the spindel and the bells. The interior is plastered, but its the damage in the chancel area has revealed the presence of figural and geometrical mural paintings of great interest. As far as its conservation state goes, it shows some deficiencies from wear and dirtiness. 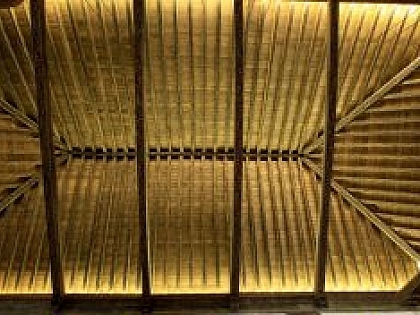 the roof has recently been improved through construction works. It has lichens in the exterior, faulty carpentry, xylophagous attacks, an inadequate electrical installation and evidences of the humidities that have affected its southwest area before the changing of the roof. 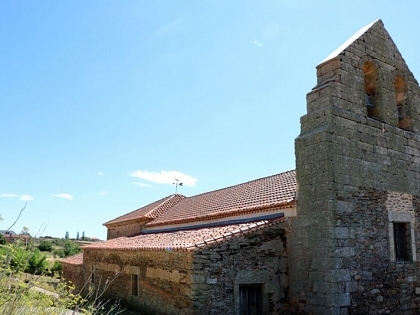 The present intervention, in the scope of the Atlantic Romanesque project will be focused on the illumination and monitoring of the church. The electrical and lighting installation has been adapted to the requirements of a building as such, considering the mural paintings especially important. For this action, has be replaced the lighting installations that were not in accordance with the building’s and paintings’ requirements with others more adequate that not only light up the space, but will also contribute to its conservation. Though the electrical installation had been renewed recently, the lighting installations had not been replaced, so the intervention has centered in its renovation. The installation presented deficiencies, specially on the light bulbs, since they were not adequate for the place. In this sense, the church’s entire illumination system has been replaced, with special attention to the lighting of the central nave and the apse. The necessary requirements to comply with the security conditions that affect a church with these characteristics have been held in account, and lights with an adjusted IRC were installed, since they emit light with no UV effects and are specially adequate to protect and conserve. Thus, the intervention has carried out the illumination of the wooden roof of a row of the central nave, by means of led surface luminaires, the lighting of the altar, the main altarpiece, the wall paintings and the structure of the roof, all this through microled spotlights. A monitoring system will be installed to control and give information on the state of the building. This preventive control system will allow the technicians to control and understand the problems that the building has, in order to undertake the correct actions for its preventive maintenance. 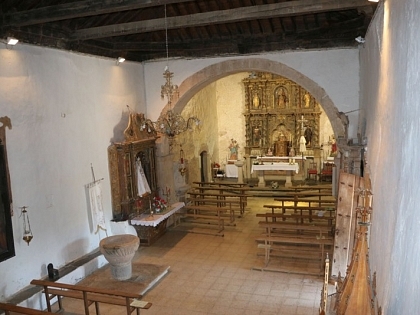 The installation of temperature, humidity and lighting sensors in the sacristy, the apse and the nave is being contemplated, in order to register variations in the environmental parameters in the building and to allow the characterization of the effect that these have in its conservation and that of the movable property that the church holds. This data will additionally be collated, through the installation of different temperature and humidity sensors on the exterior. Likewise, the installation of a xylophages detector in the bench of the main altarpiece is being contemplated. The project has be completed with the restoration of the mural paintings, financed by the Junta de Castilla y Léon. 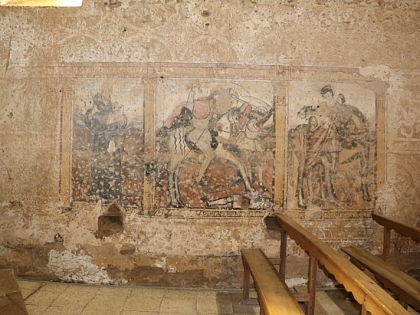 An unique decoration covers the interior facing walls of the chancel with ornamental motives sketched over the mortar, in turn completed with figurative pictoric scenes distributed on both sides. Both decorative systems could be part of the same project, since their stylistic characteristics are in accordance with each other. 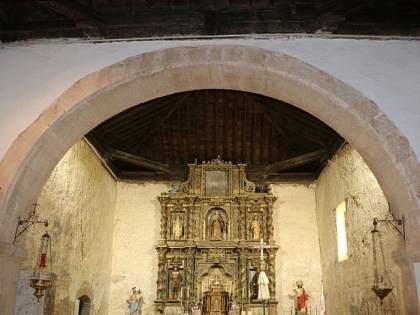 This entire pictoric set must have been done to enrich the most important area of the church, its chancel, reproducing a model characteristic from the 16th century where many small and discreet churches would ornament themselves to update and enhance themselves. The sketched decoration, created with a model, creates a contrast in colours and textures, obtaining an interesting ornamental effect and of very economic execution, over poor construction materials. The painted scenes represent, on one side, San Antonio de Padua, Santiago Matamoros and San Martín de Tours, separated by faked pilasters. On the other facing wall, we can see an Annunciation and a martyr saint. All of this in a fake altarpiece, in which there is a little ability attempt to attain some perspective. The small number of conserved cases that combine sketches with narrated painted scenes gives this decoration a larger interest. 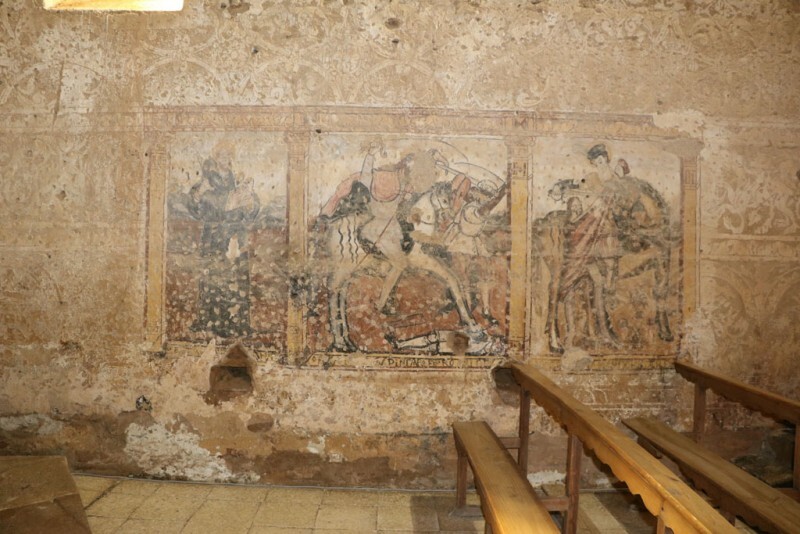 The murals had numerous losses and gaps and strong picking, detachments and lack of cohesion, smoke deposits and superficial dirtiness, whitewashing and the yellowing of the plasters. For its recovery, cleaning tasks have been carried out, as well as consolidation and fixation of mechanical gaps, material reintegration with mortar in the loss areas and very selected chromatic restorations, specially in the base area.